Commission for a co-worker/friend, he just gave it to his wife for her birthday! The story is very adorable: They knew one another in High School and in their Sophomore year, the bride folded a paper crane for the groom in one of their shared classes. He kept the crane as a memento (he had a crush on her). They ended up getting into a relationship after high school, then married. They used paper cranes as the theme of their wedding, and the groom used the very same paper crane the bride had folded him on their table at the reception. 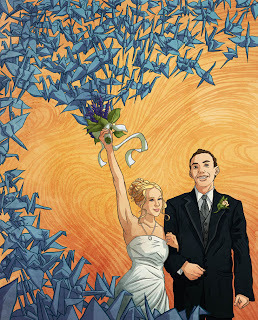 This was based off of the bride's favorite photo from the wedding; with a touch of my obsession for paper cranes included. Enjoy!